We are remarkable entity, engaged in offering high quality Namkeen Packing Machine. The offered packing machine is manufactured by our proficient professionals from optimum quality components and advanced technology in line with industry norms. 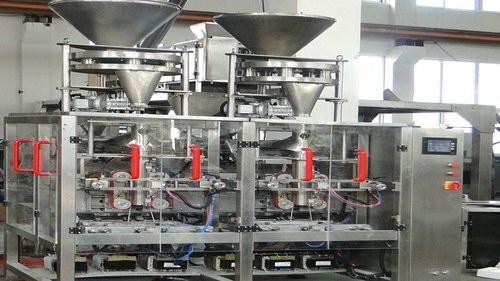 So as to ensure its quality, this packing machine is sternly tested on different quality parameters by our experts. In addition to this, customers can avail this packing machine to our clients at nominal prices. Mac Well Machinery Established in 2002, at Noida (Uttar Pradesh, India) , is the leading manufacturer of food machines, for the extruded snack food industry to a worldwide market place exporting from India to across the globe. Mac Well Machinery is proud to be an integral part in aiding standing customers and their respective businesses in attaining phenomenal success with, the use of Mac Well Machinery’s vast array of food processing machinery. Our machines are built to the highest possible specifications, are robust in construction, durable, and ingenious in design reflecting our ever-conscious efforts in reaching the acme of perfection as the leading manufacturers in extruded food industry. Since our customers rely on reputable industry hardware to manage production flow, we likewise, rely on the satisfaction and successes of our customers continually experience. Mac Well Machinery remains to this day, the first choice for many professionals, large catering organizations and small to medium enterprises as well as young entrepreneurs wishing to manage the manufacture of small to large-scale food production. Mac Well Machinery’s extensive experience and technical capabilities provide the modern caterer and food processor with equipment that not only offers the ideal solution to today's high standard of requirements along with consistently good culinary results, but does so, whilst retaining the very best in catering traditions. Simply put… "OUR REPUTATION IS STAINLESS"! Your product ideas brought to life! We produce high quality and reliable Extruded Snack food processing and Packaging Machines, specifically for the ethnic food industry, However, if you have a ‘New Food Product’ idea, then speak to us. We can help you visualize, design and engineer the machine in order to mechanize the production of almost any food product machinery, all with high quality, speed, reliability, and costing mind. Let us help make your food production processes simple and yet effective!